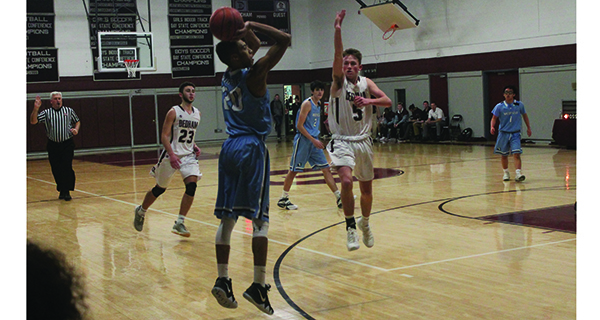 At the half of their game Wednesday night, the Medfield and Dedham’s boys’ basketball teams were deadlocked at 36 points apiece in a game that looked like it would come down to the final possession. Then, the third quarter happened, and for Medfield, disaster struck. With the top of their hair tipped blonde, the lingering results of a football team solidarity bleach job, Dedham’s guards, especially senior captain Billy Casey, caught fire, hitting three-pointer after three-pointer against a helpless and increasingly frustrated Medfield defense. Medfield tried every kind of defense you could think of, including a brief box-and-one, but nothing could get Dedham out of rhythm and stop the bleeding. 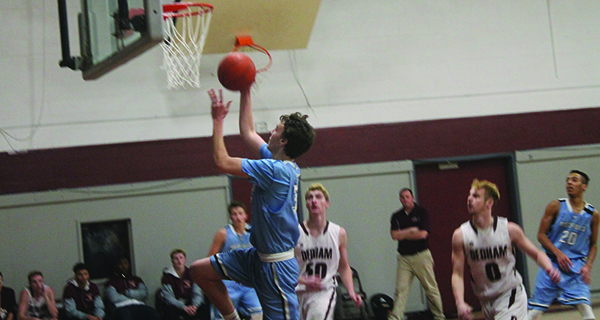 With their struggles on the defensive end creeping into their minds, Medfield began turning the ball over, which led to more and more Dedham runouts and open layups. Missed free throws by Drew Baacke were consistently followed by angry, slapping high-fives to his teammates, a telling sign of what the quarter had done to the team’s morale. By the end of the third, Dedham led 69-49. While Medfield fought back in the fourth quarter, Dedham’s lead was just too much. Ultimately, Medfield lost, 83-68, dropping their record to 0-6. Still, head coach Herb Grace saw no quit in his team when faced with such adversity. While the game, and the other five games this season, did not go as planned, Coach Grace saw some things that worked well, and he thinks the team can build on them.